Queen Liliuokalani at La Kuokoa celebration, 1896. J. K. Kaulia, president-elect of the Hui Aloha Aina, entertained the delegates and other friends at his residence on Saturday. The Hawaiian flag was in evidence, and also hoisted on the new flag staff for the first time in recognition of Independence. Queen Liliuokalani was present. The Independent, Volume III, Number 444, Page 3. November 30, 1896. Announcement of the Hawaiian Patriotic League. Great rally against annexation, 1897. By this, summoned are all those who are against annexation to gather at the Palace Square, Honolulu, in the evening of Friday, Oct. 8, 1897, at 7 o’clock, to pass a Memorial (Petition) protesting the passing of the bill of annexation, by which they want to join Hawaii to the United States of America. The invitation is extended to all of the makaainana. We are the two whose names appear below, and from the side of the Hawaiian Patriotic League and Hawaiian Political Association, by this we support and approve the call above, and we summon all the members of those associations mentioned above to go. President of the Hawaiian Patriotic League. President of the Hawaiian Political Association. Ke Aloha Aina, Buke III, Helu 41, Aoao 7. Okatoba 9, 1897. James Keauiluna Kaulia and David Kalauokalani, 1897. 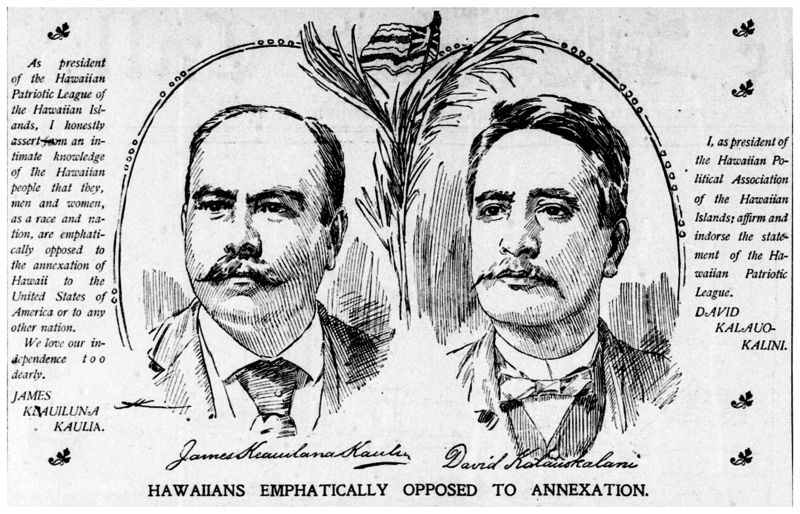 HAWAIIANS EMPHATICALLY OPPOSED TO ANNEXATION. As president of the Hawaiian Patriotic League of the Hawaiian Islands, I honestly assert from an intimate knowledge of the Hawaiian people that they, men and women, as a race and nation, are emphatically opposed to the annexation of Hawaii to the United States of America or to any other nation. We love our independence too dearly. JAMES KEAUILUNA KAULIA. I, as president of the Hawaiian Political Association of the Hawaiian Islands; affirm and indorse the statement of the Hawaiian Patriotic League. [Check out the latest in the four-part series by the Hawaiian Patriots Project. George Helm and Alice Kamokila Campbell. The San Francisco Call, Volume LXXXII, Number 116, Page 2. September 24, 1897. Kaulia’s invitation to Morgan, 1897. Says His People are Anxious to Learn From the Veteran Senator What Annexation Would Mean to Them. Senator Morgan has accepted the invitation of the native Hawaiians to address them in public meeting upon the political relations between Hawaii and the United States. Among the signers of the invitation is James K. Kaulia, president of the Hawaiian Patriotic League and president of the Aloha Aina Society. Mr. Kaulia is bitterly opposed to annexation and he is at the head of the opposition among his own countrymen. It was Mr. Kaulia who was largely instrumental in getting a few Hawaiians to gather in an abortive mass meeting at the Union Square last month, and adopt the resolutions protesting against annexation which Mr. Kaulia afterwards at the head of a committee of fifteen presented to President Dole and his Cabinet. Mr. Kaulia states that he as well as the members of the societies he represents are anxious to hear Senator Morgan and they are truly grateful to him that he has consented to speak. “We the undersigned native Hawaiians desire very much to hear you in an address upon the political relations between Hawaii and the United States and particularly desire your views as to the condition of the native Hawaiians and the position they would occupy under closer political relations with the United States. “We therefore invite you to deliver a public address to the Hawaiians in this city at your convenience upon the above subjects, and if you accept, will make all necessary provisions for the holding of the meeting. “President Hawaiian Patriotic League and President Aloha Aina Society. The meeting will be held on Thursday evening, at the Opera House, and Senator Morgan states that he will treat the question to the best of his ability. The Hawaiian Star, Volume IV, Number 1386, Page 1. September 28, 1897.